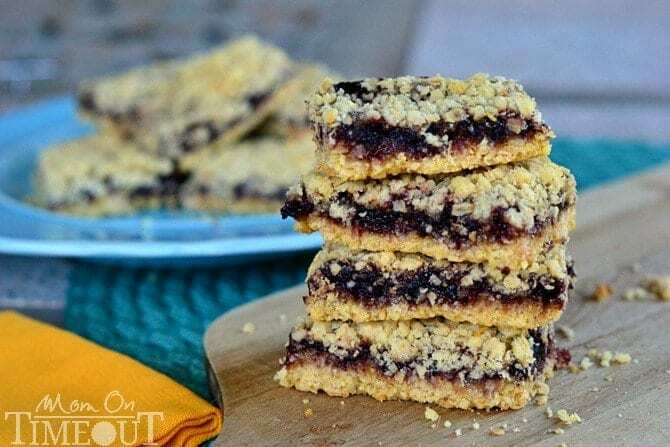 Blackberry Oatmeal Crumble Bars are made with only four ingredients and are out-of-this-world amazing! It dawned on me that I hadn’t made any of my mom’s oatmeal crumble bars in a long while and I knew they would be perfect to snack on during the day. I grew up on these bars. I started making them when I was about 8 years old and haven’t stopped since. 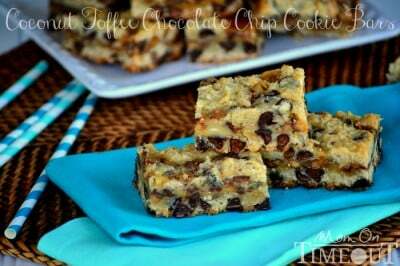 They are SO, SO, SO easy and you are not going to believe how yummy they are! 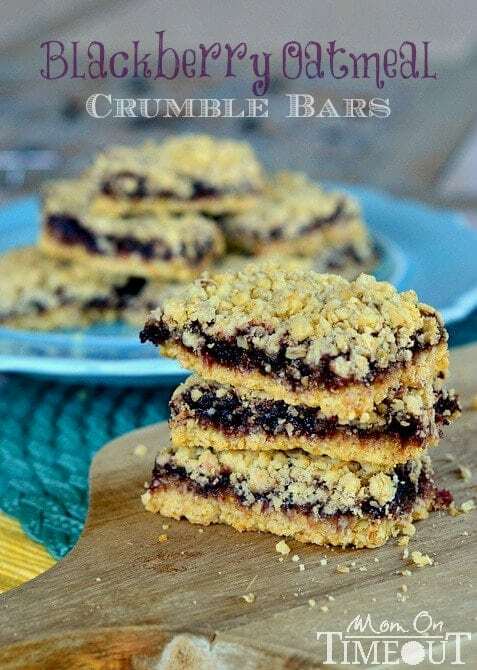 The crumble portion of the bars is made with yellow cake mix, oatmeal, and butter. That’s it. And it’s divine. Speaking of after the bars are baked…now is a good time to enjoy the bars. We do – with a spoon! Straight from the oven the bars are just heavenly. If you think of it – spoon some into a bowl and top it with a scoop of vanilla ice cream. Then you can come back and thank me. It’s incredible! I’m slightly embarrassed to say that close to half of the 9 x 13 baking dish was eating via spoon. The good news? We still had half to cut into bars the following day! Line a 9 x 13 baking dish with parchment paper or grease with cooking spray. Mix cake mix and oats in a large bowl. Add melted butter, stir until crumbly. Press down half the crumbs onto the bottom of the pan. Combine preserves and water, spread over crumbs. If preserves are already easy to spread, you don't need to add the water. Spread remaining crumbs over preserves and press down firmly. Bake for 18 to 23 minutes or until very lightly golden brown. 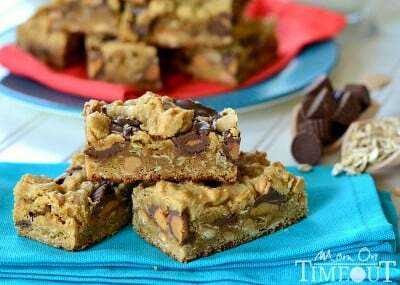 Eat warm or cool, cut into bars, and serve. 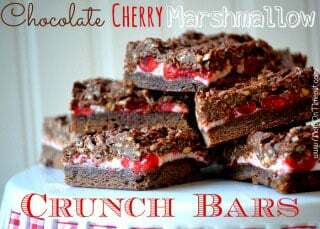 I love the variety of bars that can be made with this recipe and I’m excited to share more of them soon! Sounds wonderful! Can I use canned blueberry or cherry pie filling in place of the jam? Stumble into your blog recently and love your recipes! I only have regular oats in my pantry. Can I use that in stead of quick-cooking oats? 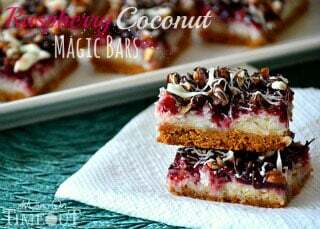 The coconut pie will be my next thing I make….. 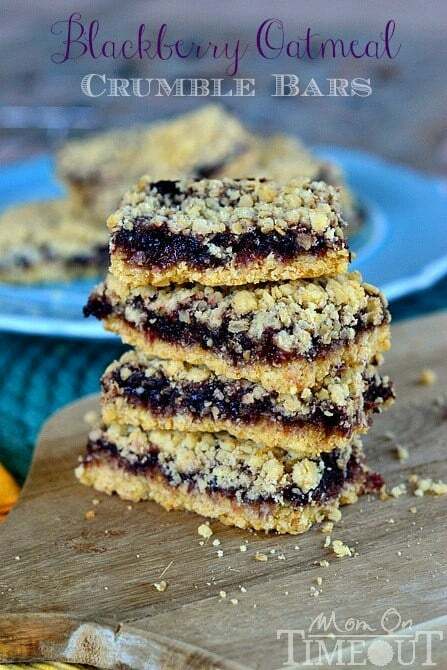 Saw this recipe at 9pm, jumped up & made a10 minute blackberry jam & made these bars. I found Ki needed an additional 3/4 cup of jam to completely cover, but these are fantastic & super duper easy. Thank you very much!?? I absolutely loved this recipe, I made this for my work for a potluck and it turned out perfect! Do you think you could us fresh blackberries instead of the jam or preserves?